If you’re looking to get stuck into your baking, this new set from Sainsbury’s has all you need to whip up the perfect bakes this summer. The cookware range includes all the essentials. 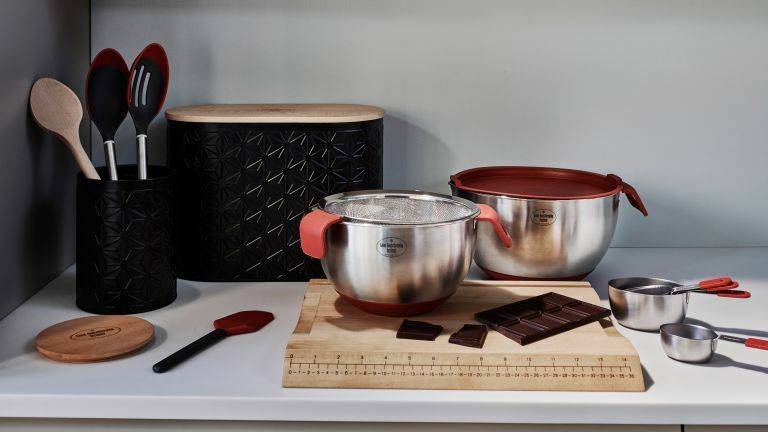 Extra-handy equipment such as space-saving collapsible measuring cups, chopping boards with ruler guides for accurate measurements, and stylish black canisters that you can keep out on display, all designed with a professional kitchen in mind. The stainless steel and silicone utensils are not only sleek and minimalist so they’ll look cool and contemporary if displayed on open shelves, but they also have heat-resistant handles making them perfect for everyday use. Stylish, quality cookware that will last, all at an affordable price, is available from May 2018 in store and online.